Chord diagrams provide a way to visualize tabular datasets in an appealing and informative manner to show directed relationships between categories. What is the volume of flow between categories? Are there anomalies, differences, or similarities in the volume of flow? An insurance company is reviewing the types of policies it offers to compare its current offerings to the findings from a recently completed market research project. One step in the review is to compare the total insured value (TIV) of policies in each policy class across cities. A chord diagram can be used to visualize the distribution of subgroups for each category. The chord diagram above provides a sum of the TIV for each category of insurance policy across cities. 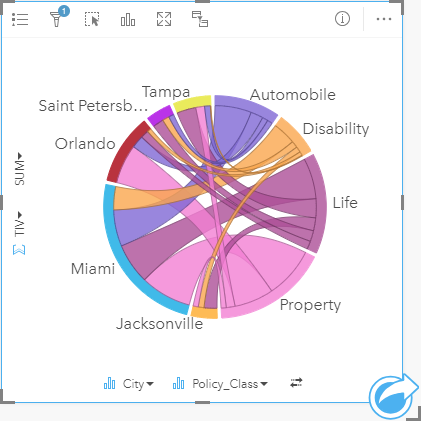 The Policy_Class values (Property, Life, Disability, and Automobile) and City values (Miami, Jacksonville, Orlando, Saint Petersburg, and Tampa) are displayed as different colored arcs around the circle. The length of the arc and thickness of the chords are determined by the sum of the TIV. You can see not only which city or policy class recorded the highest and lowest values, but also the policy classes that contribute to the sum of TIV for each city. Miami recorded the largest sum of TIV in each policy class, while cities such as Saint Petersburg and Jacksonville have policies in three out of the four policy classes. When the values in the two category fields are the same, the rate/ratio layout is used. Each chord is bidirectional, with its thickness and value determined by the extent of the relationship or volume of the flow between the categories. A census bureau department is studying the state-to-state migration flows among eight states on the West Coast of the United States in a particular year. A chord diagram can be used to determine the migration behavior among the states. 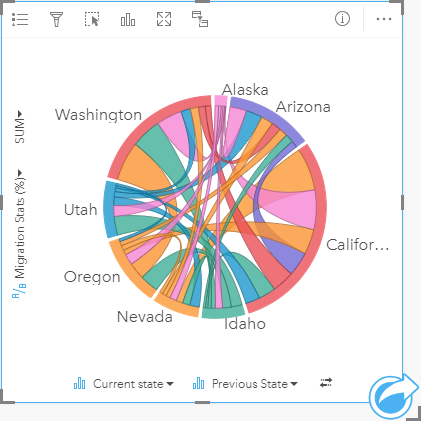 The states (Alaska, Arizona, California, Idaho, Nevada, Oregon, Utah, and Washington) are displayed as different colored arcs around the circle. The arc length for each state represents the flow (migration) into the state, so you can see which states recorded the highest influx. The chords show the directed flow between states. In the ratio layout, each chord represents the bidirectional flow between two states, so tapered chords indicate more volume of flow in one direction than the reverse. For example, more people migrated from Alaska to California than vice versa. If you do not select a number or rate/ratio field, your data will be aggregated and a count will be displayed. Drag the selected fields to a new card. Hover over the Chart drop zone. Drop the selected fields on Chord Diagram. You can also create charts using the Chart menu above the data pane or the Visualization type button on an existing card. For the Chart menu, only charts that are compatible with your data selection will be enabled. For the Visualization type menu, only compatible visualizations (including maps, charts, or tables) will be displayed. Chord diagrams can also be created using View Chord Diagram, which is accessed from the Action button under Find answers > How is it related? Chord diagrams are symbolized by unique colors. You can use the Legend button to view the categories and the corresponding colors, and to select features on the chart. To change the color associated with a category, click the symbol and choose a color from the palette or enter a hex value. The categories are arranged in a circle as arcs. The chords are the links or connections between the arcs in the circle that show the relationships or flow between the two categories. The length of each arc and the thickness of each chord are determined by its value. The values in the chord diagram can be symbolized as a count of features in the categories or as a number or rate/ratio field. If a field is used, the values can be calculated as a sum, minimum, maximum, or average of values from the field. Use the Visualization type button to switch directly between a chord diagram and other visualizations, such as a grouped summary table, bar chart with a Subgroup field, data clock, or heat chart. When you create a chord diagram, a result dataset with the string and number fields used to create the chart will be added to the data pane. The result dataset can be used to find answers with nonspatial analysis using the Action button .